A century ago, Wilfred Owen, one of the greatest of the first World War poets wrote ‘Dulce et Decorum est pro Patria ‘ [It is sweet and right to die for your country] It was a bitter commentary on the savagery of war, written from Wilfred Owen’s personal experience. Move forward to the present day, and Owen Sheers, also a poet, gives a dramatised account of three young men who leave Bristol to fight in Afghanistan. Has much has changed? Absolutely nothing. Because however ‘sophisticated’, however ‘primitive’ the weaponry, now as then, the outcome is the same, the probablity of death or terrible injury. Of the three young soldiers, one is blown up by an IED, another loses both legs, the third loses his mind. From the outset, we’re faced with the shocking reality of war. The title, ‘Pink Mist’ is a reference to the fine cloud of blood which enters the atmosphere after a soldier is blown up. The opening scene shows the six characters, the three soldiers and their wives or mothers, enacting a synochronised and poetic dramatisation of their lives. This is physical theatre at its best. Carefully choreographed, their gestures and movement communicate firstly, their experience of the everyday, growing up in Bristol, then the lure of the Army recruitment, with its promise of excitement and challenge in the company of friends. But this is to be short lived for what follows is the reality; the tragedy and the futility of war. The background sounds of war, such as the sudden explosion which is coupled with a woman’s long, drawn out scream, adds to the horror. And through it all, is Owen Sheer’s evocation of the men’s thoughts and feelings, dramatically expressed in verse, as in a Greek tragedy. 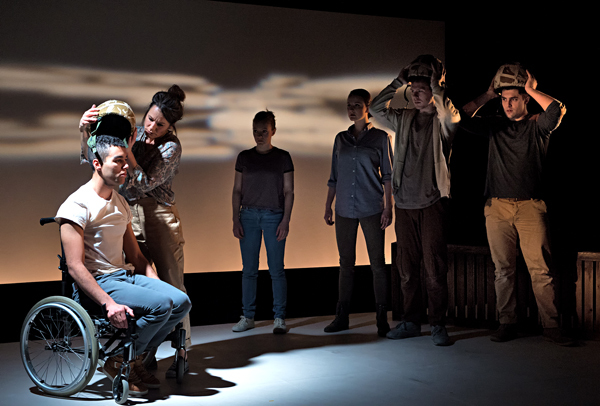 The production of ‘Pink Mist’ is brilliant, each part, the script, the acting, the lighting and the sound all contribute to a profound understanding of ‘the pity of war.’ It’s tough to watch and must have been excruciating for the actors, but it’s a powerful comment on the reality of war.